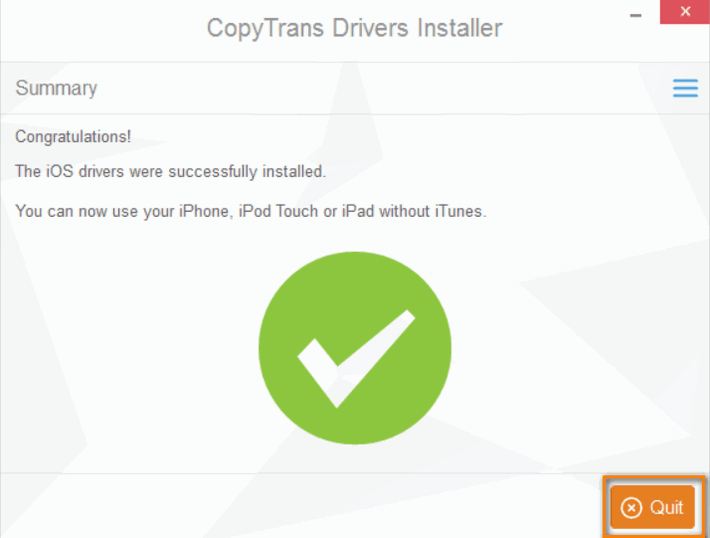 CopyTrans Drivers Installer is used to install the drivers required for Windows PC to manage iOS devices. 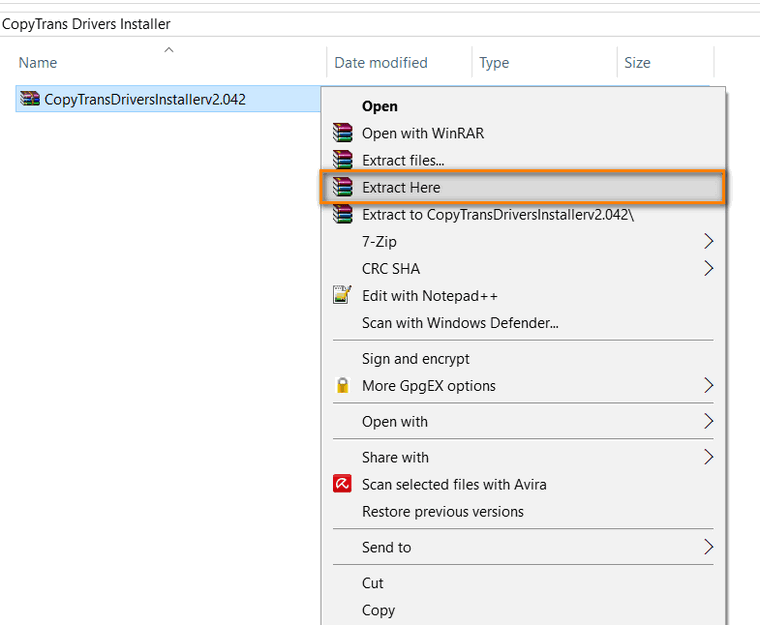 This article explains how to install the drivers manually. 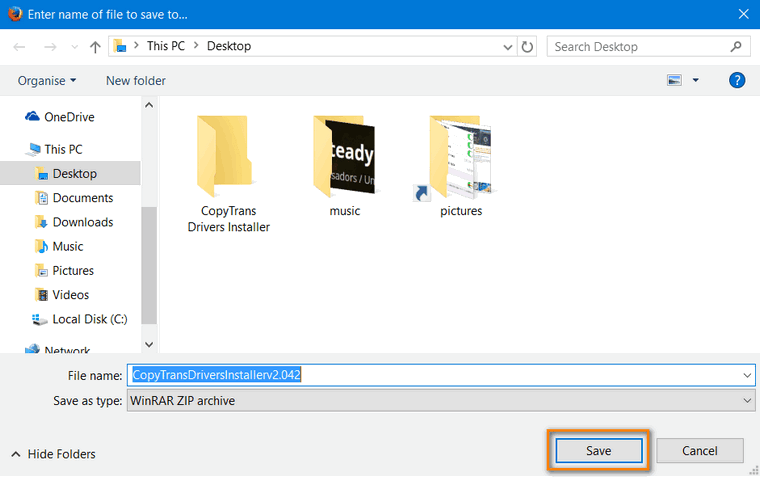 This method is used if you need the drivers from earlier versions of iTunes (in case you are running a Windows XP, for example) or want to install CopyTrans Drivers Installer on a PC with no internet connection. Note that in order to activate CopyTrans programs you’d still need an active internet connection. Click “Save File”, then click “OK”. In the opened window, select the location and confirm by clicking on “Save”. The archive is now on the PC. Go to the folder where you saved it in, right-click and select “Extract here”. 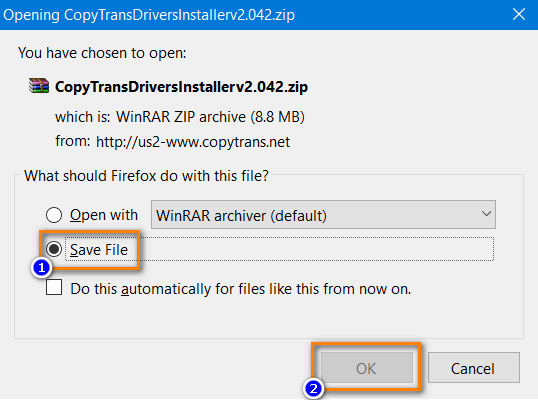 Tip: If you do not have a program for zip files, you can download the trial version of WinRAR here: WinRAR (32 bit) or WinRAR (64 bit). 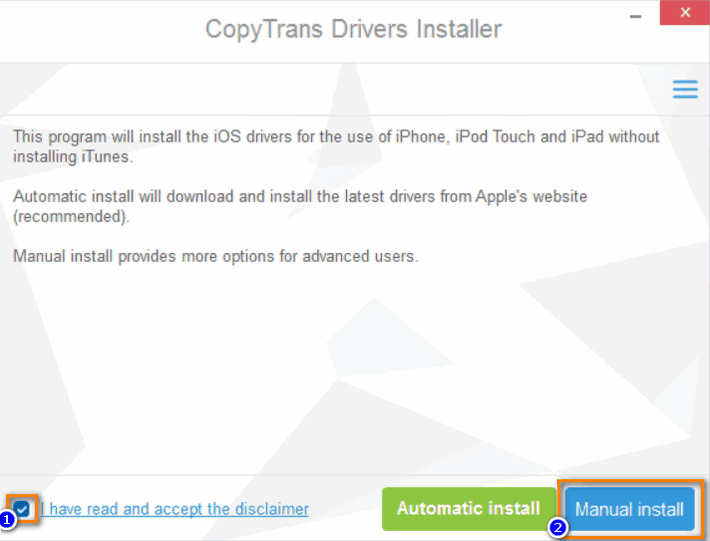 Before running CopyTrans Drivers installer make sure that all CopyTrans programs are closed. Double-click to run the file. 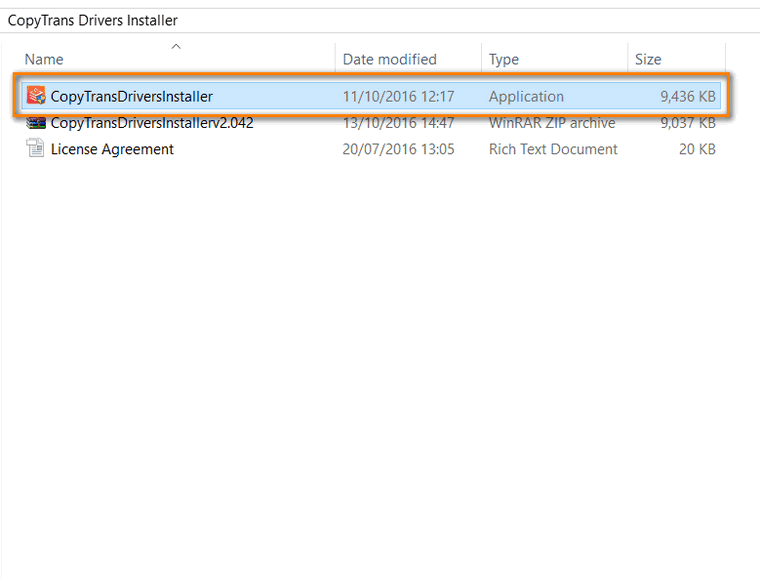 Please read and accept the license agreement to install the drivers. Check “I have read and accepted the disclaimer”. Click “Manual install”. 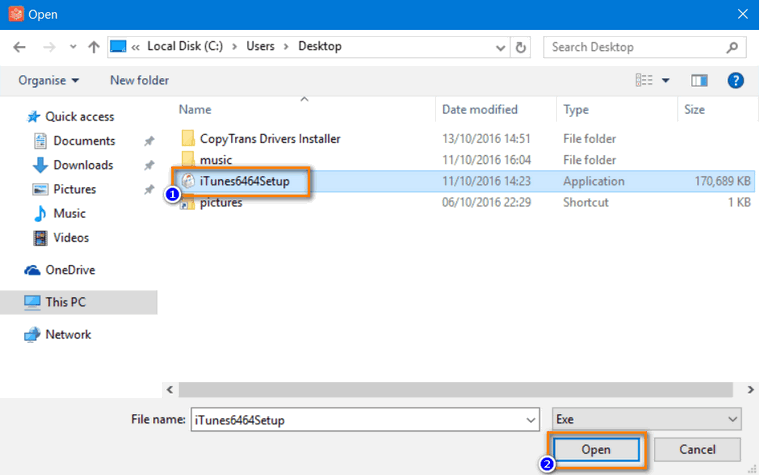 Now you will need to select the iTunes installer file (.exe) and click “Open”. You can download the latest version of iTunes on the official Apple website. If you have a Windows XP, you can download the latest supported versions of iTunes here: 12.1.3.6 version for Windows XP Service Pack 3 or 11.1.5 version for Service Pack 2. Note that you only need the .exe file, there’s no need to install iTunes. Once you’ve selected the file, click “Install now”. Once the installation is complete, you will receive the following message. Just click on “Quit” to close the window. That was it! Now you can manage your iPhone, iPad and iPod Touch without iTunes.